How can you use your athletic mindset to face challenges beyond sports? 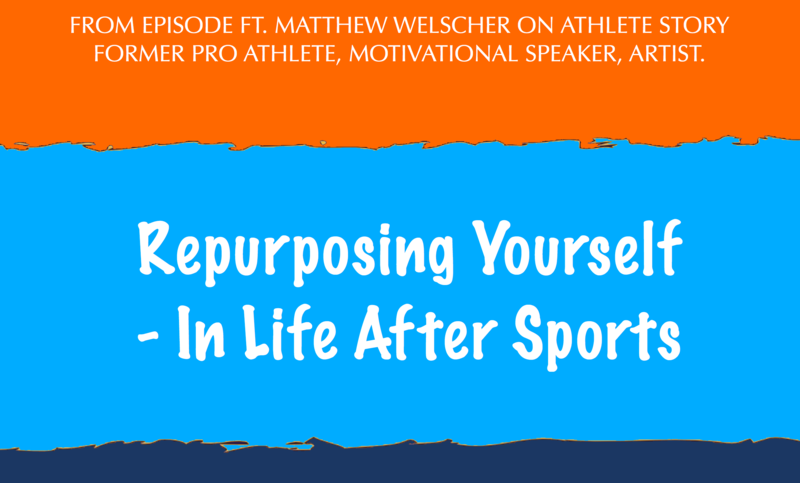 In this episode Adventure athlete, Matthew Harlow Wetschler shares his incredible story and how he has managed to find himself and thrive in a life where most of what he cherished was taken away in an instant. How what saved him was: Knowing his core values and his athletic mindset. You will hear Matt’s experience and tips on…. To save YOU the hassle and time, I have taken great notes for you. Matthew Wetschler was a national level elite rower in high school. After a burnout from the hard training – that he had to do on his own, he turned to his childhood sport of skiing to explore his limits and curiosity for how far he could take it. On November 15 2017 Matt had a deadly accident while body surfing. It did actually take his life for about 10 minutes when he was floating face down in the water, unconscious and – as he discovered two days later when he woke up from coma – paralyzed from the neck down. He thanks science, luck and his athletic mentality for today being able to walk again. Today Matt shares his story as a Motivational Speaker and Artist. Once again thank you to Scott Fitzloff for letting me use clips from his video portrait of Matt. Drone footage by Tylor Norwood. In-hospital footage by Dane Wetschler. You can also watch a video version of this interview here. READ the transcript of full interview by clicking here. Hi, you are in for an inspirational Athlete Story about pivoting into life after sports – when you have no choice but to do so ! You can say that it is about seeing opportunities in challenges – only that is a ridiculous understatement n this case. Today’s Athlete Story comes from adventure athlete Matt Wetschler who woke up to a very different reality to say the least, than what his life had been based on until then, when he woke up from a deathly accident that he had while body surfing. It actually took his life for ten minutes – his mobility from the neck down for quite a bit longer – and today it has changed his perspective and circumstances in a way that has transformed his life – but NOT who he is. And I think that is the essential message that we can all learn from Matt’s story. As you will hear, he did not let outside circumstances, his sports awards, his Powder Award, his Stanford education or his work as a medical doctor, -nor his paralysis – define who he is. This is very relevant for anyone who stands in the middle of – or in front of – a big transition in life. Matt’s story is an inspiration on how there are so many different ways to express yourself – as long as you know who you are and what you stand for – even if you can no longer do what it is that has fulfilled you in your life up intil now. . This is athlete story and I’m your host Anja Bolbjerg. If you want to get notified whenever I upload a new show, do go ahead and subscribe. I will be posting lots more athlete stories, interviews with world class sports insiders and valuable tips for athletes. If there were such as thing as a gold medal at winning in life – Matt Wetschler would be having one. So, let’s welcome the multi-talented, life winner Matt Wetschler. Anja: Hi, Matthew welcome to the show. Matthew: Thank you. Thank you, Anja. Anja: I’m so glad you could make it. Anja: You have been involved in sports pretty much all of your life. Matthew: In one way or the other, can’t quit it. [laughs]. “I woke up two days later in an intensive care unit. Alive but now parayzed frmo the shoulders down. In those first hazy moments I had a strange thought. I had not idea what was going to happen next. Anja: If you can take us back to a little bit of your background story, as an athlete and some of the sports you’ve been involved in a competitive level. Matthew: Yes, absolutely, I would say I’ve done a lot of things in my life. I’d say my deepest identity I would always say is as an athlete. That athletic identity has been the bedrock for almost anything else I’ve done in my life. So it’s very meaningful to me. Where it started I say, early high school and into college, I was a competitive rower. I rowed at a national level with some club teams and was second in the country a few years in a row, in multiple events at nationals, and was slotted for a pre-Olympic training program. But for reasons of where I was going to school at the time, they didn’t offer rowing, I was essentially training on my own, like doing two a days. [laughs] Just solo for months on end, and then I’d link up with this training program in the summer. We would travel and compete and so after about five years of that I was completely toasted and let go off rowing. After college, I moved out to Jackson, Wyoming, which is a big ski town and was a ski instructor for a year. Then just gave into the call of the wild, so to speak. I mean I’ve been skiing since I could walk, and just decided to try to become a professional freeskier. I was sponsored and traveled up and down the coast and over to New Zealand, skiing pretty much year around for several years working with filmmakers and photographers, and in 2006 won the Powder Magazine Video Award for Best Natural Air. Which is a front flipping 360 off of the 60 foot cliff, back in the time where people weren’t doing that, so cork seven. Now, because of where our equipment is and sort of the pathway by early skiers, it’s much more common, but at that time and say only one other skier had done something like that, which is Seth Morrison. Anja: The legendary Seth Morrison. [laughs]Matthew: Yeah, which we’re all familiar with. Those epic backflips. [laughs]Seth had made a couple of attempts in Alaska the year before with recapturing ski movie two and I think that was like around 2003 or ’04. A few of us out in Jackson we really just saw this thread of progressive skiing in the backcountry, and let go of everything else and just pursuing it aggressively, trying to land switch off of cliffs, and do these multi-air lines with technical rotations in the middle of it. Like I said while now it’s quite common place, at that time it was a small step forward. I ended up injuring myself in I think 2006. I ended up meeting a woman who was from Pakistan and accepting an invitation and I moved to India and lived in the slums of New Delhi for a year. I volunteered with women and children and that was a crazy experience, very challenging. Anja: Did you go with this specific purpose? Matthew: Yes. What had happened is, I had injured myself and instead of sitting on a couch watching movies and taking pain meds… you know I have a hyperactive mind… I was an artist or like, had been artistic almost all my life. I started painting again and I ended up starting a contemporary artist cooperative with a few other artists in the town of Jackson. Then also started working with kids. I ran a bunch of art based teen programs out of a center, and just really enjoyed helping other people. Just had active thinking outside of myself, thinking about others and making others well-being a focus, it’s all good in this very fundamental way. I was also reading a lot of spiritual texts at the time, a lot of Eastern spirituality and philosophy. Just whenever I get into something I really get into something. I had briefly been to India in college just for a week and it flipped my world around. I figured, “Hey if a week there can do that to me what would a year do?” This opportunity came up. I literally met this woman on an elevator like a 30-second conversation in an elevator turned into a three-hour conversation at my office, at the Teen Center. Then a few minutes later I had this opportunity to volunteer at a small nonprofit in New Delhi. Yes, with that open mentality of saying like, “Hey, what would life look like if I just stepped away from really being so focused on seeing, what would happen?” I decided to go for it and just sold most of my very meager belongings to get the cash to do it and, while I was there, decided that helping people was very important to me and I wanted to make a career out of it. My dad had been a doctor. And so I never wanted to be a doctor. But I was by that time a little bit older and more mature and keen to the idea of medicine authentically. I now like the fact that it had at its core of the effort of helping others. After about a little under a year in India, I cut my stay short and came back and started studying to go to med school. I was a philosophy and art major – which my parents were so excited about. Anja: [laughs] I can imagine. Matthew: Just ready to take over the business world with that combination! You know, so I had never taken a science class. I had to start literally from ground zero and I did a program that got all those classes done in a year and then managed to get into med school after one round of applications which isn’t always a given so I feel fortunate. About 10 years later from that decision I did become a doctor. During that time going back to the athletics, I still couldn’t quit it and I went into ultra-endurance sports and competed in iron distance triathlons. I did two sprints and then I did an iron distance. And for those who do the iron distance my time was 9:44 I think so sub- 10 which I’m proud of. I placed I think 17 out of 700 in my first attempt. Anja: You’re a multi-talented athlete, you’re an artist, you’re a medical doctor. [laughs] Is this a curiosity-driven or is it fear of missing out? [laughs]Matthew: Or lack of commitment maybe. [laughs] While the surface looks different whether I’m practicing art or doing a sport or studying something academic the mentality is the same which is really a curiosity, a curiosity of what my personal capacity is. I think that is the fundamental orientation of an athlete. You talk about what does it take to perform at the highest levels? At some point, I think you have to stop comparing yourself to others and it’s really a relationship with yourself. A lot of people don’t get that. They spend a lot of time thinking about what other people are doing. Once you can let go of that fear of how am I in a relationship to others and reorient yourself like, “What am I in relationship to myself on my own abilities?” That orientation that makes us healthier, much more productive, and also unlocks our abilities in any direction. Anja: You had the determination. Matthew: Yes, exactly. I just made the commitment. I said, “You know what? I would be the person to put in the most time.” [laughs] I did, I studied six, seven days a week, twelve hours a day. I studied actually so much that changed my eyesight. [laughs] Then a year later I managed to get the grades together to get into school. Anja: Was there a point where you had a burn out from studying so much? Matthew: I think the fire was very hot early on and I’d say that mentality, “I’m just going to push myself, I’m going to put in the time and I’m going to put in the effort and this is going to be not about trying to get a better test score than somebody else but just trying to be the best that I can in this new world.” And defining what that means to me. Not by somebody else’s definition but by my own definition. I would say that I held to that mentality for about two years and then it really started to have a dark side where I reached exhaustion and I think this is a great lesson for any athlete as well. There is a shadow side to the athletic mentality in that many meaningful projects we have in our life are marathons rather than sprints. When you hear about stories of success, often they are told in retrospect and they’re told in a way that makes it seem like there was this moment where a project started in the garage, and then all of a sudden, there was this exponential growth and skyrocketing to success. But the real story is often that there is a flare of excitement, and there’s the track through the desert where there’s so much uncertainty and you’re never given the gift of complete success or complete failure because either would be easy. Even like a complete failure is gift. You’re like, “Oh, that definitely doesn’t work.” Often, you get the half success. Last month worked and this month, not so much. That is really trying. And I think having a framework that orients us to survive that track through the desert to get to the success which will happen if we are persistent. That requires a little bit of a different framework other than, “I’m going to dig deep. I’m going to leave it all on the field. I’m going to give it 110%.” Which is I think the classic old school mentality. Anja: We tend to forget that there’s phases and there’s a phase where that mentality works really well. It will take you this far, but then, you are going to transition into a new phase, and then the famous saying that what took you here is not going to take you there whatever… however that goes. Matthew: Exactly. I think that idea of seeing as different phases… Those frameworks are different tools – each have their own time and place. Regardless of what you’re doing, you’re going to find yourself in a moment where there is a deadline. We do have to redline it and push and kind of dig deep. I’d say the traditional athletic mentality can serve you well, but if that is your only tool to success, I think it will fail you in the long run. You’ll exhaust yourself and you won’t have the endurance to just hang around for success to come naturally. Whether it’s a following to grow or to build enough expertise where you are valuable in a new industry. The trick for that is less about just unyielding intense effort and more about emotional perseverance. Being able to wake up each day and put in a solid effort, but in a way that is sustainable. That’s been my personal evolution in how I have harnessed the energy of an athlete into something that has served me well in other pursuits. Anja: Maybe we should get into that. You had an accident when you were out surfing last year that changed a lot of things for you. Do you want to talk about that? Matthew: Yes. A couple years ago, I finally finished residency and I became a doctor. That was a decade long effort and with its own challenges. And then a little bit under a year later, I will lose body surfing by my house and I broke my neck… and drowned. A stranger found me floating face down in the water paralyzed and unconscious. They pulled me out and I didn’t have a heartbeat and I wasn’t breathing. People think that I’d been dead for about 10 minutes. To my good fortune, on an almost empty beach as I got pulled out, there was a person walking by. It was a nurse, and then another person walking who was a doctor. He did CPR and they brought me back to life. I woke up about two days later in an intensive care unit but I was alive, but then I was paralyzed from the shoulders down. I spent about two months in the hospital in a wheelchair and have been home now for about eight months and have had a very fortunate recovery to where I’m completely functional and independent and even starting to be athletic again. I hope to be surfing in just a couple of months. Anja: You we’re there body surfing, and the next thing you remember is you wake up and you cannot move, and you had been dead, actually? Matthew: Yes. Basically, I have a memory of waking up paralyzed in the water and then losing consciousness again which is really intense, but for the most part, yes. I was apparently conscious and interacting with people for a couple of days, but my concussion was so bad that I lost maybe three days worth of memory. Really my first early memories were just in the intensive care unit. Anja: I imagine – No, I don’t imagine because I can’t imagine but this is where you pull all your resources together, everything that you learned from athletics, from studying, from your arts. Matthew: Yeah, you know, I’ve now been telling my story to people. I’ve been speaking publicly and doing some motivational speaking. I feel compelled to do so because a lot of the frameworks that I have collected over the years through my different activities, and have had to refine as new challenges arose, they were there for me. I’ve found myself surprisingly well equipped to meet the most intense challenge of my life which is having my entire body taken from me, and my life briefly taken from me. I was able to really meet the challenge head on. It sounds self-congratulating for me to say it but if you talk to people that were there at the time and interacting with me in those early days when I was in the hospital, for some reason I was just unyieldingly positive and optimistic and have a lot of levity and laughter. The nurses there say that they see two types of people in the hospital and it’s those that believe that they will heal and those that don’t. And the way that their stories play out, it’s almost that they fullfill their own destinies. I was probably one of the few people to ever walk out of the hospital after a spinal cord injury. I’d say the doctor who had been working there 20 years and maybe seen one other person do that. I walked out on crutches but I did walk on my own two feet. And while I will always acknowledge the science and the luck of the type of injury I had and the support of my family. I do think a small part of it was also the framework with which I approached it… which was again as an athlete. Anja: wow. Very inspirational. So when you go out and make speeches at universities and stuff, do you have this framework you talk about? Matthew: The framework that I’ve been talking about is around this poem that I’d love by a woman named Nayyirah Waheed. She’s African-American. The poem is really a message to her community about how to persevere for a long struggle. At the time that I found it, I was very deeply depressed, in residency. I saw it as a recipe for what we needed for our own personal resilience. And eating water is about the nourishment that we need for our journey and eating stars is about the psychologic importance of orienting ourselves towards a vision. So using those two concepts, I encourage people to be vision-oriented, rather than goal-oriented. When we see something that we’re striving for as a finish line, it encourages us to believe that our sense of value and accomplishment can only come from that moment of arrival, from the moment of achievement, and when we believe that, then we’re very tempted to start sacrificing our needs in the moment, to start denying our daily requirements for the sake of this future moment. It’s a very fragile form of motivation because when unexpected things happen, which they will, because we can’t control the future and we can’t control the world around us, all of a sudden we feel unfairly blocked, then we get exhausted and frustrated and burnt out. We feel like the finish line has been moved, or there’s been this unexpected challenge. So, while we should be inspired by a vision, we shouldn’t believe that holding on to the promise of accomplishment will be sufficient to motivate us for the long journey. Instead, I encourage people to fundamentally reorienting ourselves to see and recognize process and progress. That’s something that we can acknowledge in each day, and in doing that, we actually have a way of living our daily life that nourishes us and gives us energy, despite what’s happening externally. The combination of those two can really unlock us and allow us be fully present and fully engaged in a long effort, yet resilient to unexpected challenges. So, have a vision rather than a finish line, and focus on process and progress. That can be whether you exemplified certain values so exercised patience, exercised self-forgiveness, eating well, or doing a daily meditation practice. That’s a moment of success. Anja: Then, it’s about not depleting yourself, I guess. Matthew: Exactly. I mean, recognizing that you need to meet life in a way that allows for indefinite effort. That’s really the balance, that we should care about where we’re going, but we can’t only care about where we’re going, because we won’t last otherwise. Also, when we’re process-oriented rather than finish line-oriented it allows us to be agile, allows us to respond to new opportunities and not be so beholden to a need to get to some place. Sometimes maybe that’s not the best thing. We could be fighting against a real opportunity in another direction that we’re ignoring because we’re so finish-line focused. Anja: I think that’s an awesome image to have. Your background is in medical science, so you know a lot about what this injury means and what your odds are. But you’ve also been to India and… did you ever go to seek some more of what we would define maybe as woowoo? Matthew: Yes, the woo. There’s a lot of woo in San Francisco. I’d say I’m not anti-woo. It’s a balance. I was having acupuncture multiple times a week. I do massage therapy, I’ve had some energy work done. As a patient with a severe injury or chronic illness, for anybody listening that deals with that, there’s always a balance between living life and healing yourself. It’s very easy to get into the mentality where our sole identity is as a person healing, which is really centering or identity around being broken, and that needing to be fixed. At some point, we need to acknowledge that no matter how our body is, we’re still whole, we’re still capable and we’re still powerful. I try to strike that balance. Now, I do some massage therapy and I do personal training four to five times a week. I’m fairly disciplined about my diet. Those are my personal investments in my body. Things that I’ve shaved away and no longer do the acupuncture, I don’t do energy work anymore and some other more specific types of therapy I’ve let go. Mostly because I just don’t want my life to be shuttling between doctors. I just want to live. That’s been my own personal answer. Anja: I think I read somewhere you talking about the sameness even with a complete 180 of your life or whatever you call that. That there is still a sameness that follows you and that is constant and that you are using this. Matthew: Right, I’d say, one of the insights that I took from having a relatively normal life one day, and then having this catastrophic injury the next, is how similar my choices were before the injury and after the injury. I see that life has these buckets of experiences, whether it’s things we can do and things we can’t do. Things to be appreciative of, things to be frustrated by, people who love us, people that we’re in conflict with. What fills those buckets as a new quadriplegic or a lottery winner, it’s different – but there will always be a relationship to a limit. There’s things that we can’t know that we can’t control. Things are always going to change. We don’t know the future. That’s a constant. A year before I was finishing out residency at Stanford seemingly from the outside at the top of my game. I was emotionally bankrupt. I was completely exhausted and more depressed than I’ve ever been. I had a coming to terms and did manage to turn it around and finish in a good headspace which is kind of another story. And a year later I woke up paralyzed and I had more laughter, levity, and optimism than almost any other time in my life. Having those two experiences pressed against each other made me realize that we are overly focused on our external world to determine how we feel internally. That whether we know it or not we convince ourselves that it is this delicate constellation of the things around us that’s making us happy or unhappy. The truth is if any of us go through a catastrophic experience whether its financial or you have a house fire and lose all your possessions or you have a new injury, one of the empowering things is realizing that so much of what you thought was precious and needed for you, when it’s taken and you wake up the next day and you’re still the same person. And you still have the capacity to be frustrated. You still have the capacity to be happy and appreciative. Realizing that it’s our orientation rather than our external circumstances that determine whether we meet life with frustration or grace. Anja: I think that’s a very useful perspective to any athlete. All athletes are going to go through a phase of transition into life after sports. For many of us, myself included this phase is hard because there is this change of identity – at another level than yours! But it’s the same principle… if you can come to that conclusion hey, I’m still the same. Matthew: Yes, exactly. The change of identity…I mean, what that would presume is what we do is who we are. That’s not the case. For example while neither of us may be skiing now but we still have the identity of an athlete. That is much more flexible than they think we would give ourselves credit for. That’s something that I would emphasize to any professional or competitive athlete that the mentality that you hone through your activity is your single greatest resource. It’s also almost universally applicable to anything else. It’s so powerful. It doesn’t need to only be expressed through a physical activity. It can be that same mentality of whatever framework got you to the level of physical and athletic performance can be applied in a business sense, can be applied in an academic sense. I would say it’s one of the most powerful frameworks that we have as individuals. Anja: And with that comes the story that we are telling ourselves as well. Because, your story could easily be my life is not worth living anymore because I can’t do the same things that I used to be able to do. I have to change everything. I’m not myself. But that’s not the story you’re telling yourself. Whether you did that on purpose or not I don’t know but….? Matthew: Even now I move quite fluidly but I don’t have feeling in my hands. I don’t have very good balance on the right side of my body. I can only lift about five pounds over my head with my right arm as opposed to 50 or 60 before. A lot of my life I was invested in the idea that I was a strong and capable and athletic individual. I’d say a few things. Athleticism is not an objective state. You can be athletic at any level. Even though I can only life five pounds, maybe next week I’ll lift seven and a half pounds. How far can I get? How many reps can I do with my five pounds? How high can I lift my arm today? Will I move my right foot today? Will I walk more? Will I be able to run? Will I be able to surf again in any way? It’s that curiosity of what am I capable of? Matthew: I think that’s a great way to sum it up. It’s a growth mindset and that never goes away. While it might not be now objectively impressive to other people because everybody can lift five pounds like, I can’t. It feels really rewarding to just engage in that and have that mentality. And then the other thing is letting go of the idea that we have to be able to do everything to be happy. First that’s not true. Everybody in their lives have things that they can and can’t do. Things that are available to them and are not available to them. In my life it’s very visible. Anja: Well, because you could do anything basically. [laughter]Matthew: I have very real physical limitations and that also might limit my ability to practice medicine again. I still can’t go back because I don’t really have dexterity in my hands which is necessary. You know, early on in my injury, I let go of the idea of waiting to be normal again, or waiting to heal to feel okay. Instead, I embraced a mentality that being able to do something is enough to be able to be a full person and to be powerful. That instead of focusing on what’s not available to me, starting with the curiosity of what I can do and moving with that. What I can do right now, is I can make art. For the last six months I’ve been just fully investing myself in artistic practice. I have two studios now. I’ve had multiple shows. I work with a gallerist, and just last month I cleared over $15,000 in art sales and managed to support myself. I think without the provocation of a physical injury and the inability to do anything else, I would have never given myself the luxury of fully going for it, and fully committing. And so while I would never opt in to having a spinal cord injury, definitely not a box I would check. It has not been a negative experience. We’re talking because of this spinal cord injury. I am now a successful artist because of a spinal cord injury. I am getting paid to speak at large companies because of the spinal cord injury. My life has blossomed in a way that I could have never expected. It’s blossomed also because I allowed it to, because I saw potential rather than limitation. I think that’s a great challenge to anybody listening: Start with what you can do, rather than what you wish you could do. And move with that and give yourself to it. As an artist, lines and boundaries create shapes, and shapes are the precondition for beauty. The limitations in our lives are the lines they create a beautiful life and a life with shape and direction. Anja: Nice, I like that. Matthew: I’m also trying to be a poet. [laughter]Anja: You’re getting there. I had my notes somewhere, you said the canvas is treated as an arena for action, rather than a window for representation. What do you mean by that? Matthew: The type of painting I do for anybody curious, it’s a style called action painting. The focus in action painting is how the painting is created, rather than what the painting looks like. If you think about renaissance painting where you’re looking at a pastoral landscape or some people laying on a bed. The canvas is treated as a window to another time or place or emotional state. With action painting the canvas is treated as an arena to act on. It captures the aftermath and an artistic movement. The style of art I do rituals or activities or motions in repetition until my body fails. And I capture that process of the decay of energy and ability on a canvas, and that’s what makes the art piece. Anja: You do a repetitive gesture? Matthew: Yeah, for example, I’ll tie a weight around my disabled arm and I’ll lift it again and again and again until my arm doesn’t work anymore. And so what you’ll see is a lot of vertical lines that become shorter and shorter and shorter. Anja: So It’s kind of making that fatigue visible in a way? Matthew: Exactly, also the echoes of athleticism of a curiosity to find a personal limit. Something else that I’ve been– this is getting a little bit more woo, to bring it full circle. I have no memory of what happened when I briefly died. It’s like the movie reel cut and then the movie reel started. There is this absence, like a very deep profound absence in my life. That absence and that void has been the most definitive experience I’ve ever had. There’s this very interesting juxtaposition between something that’s been profoundly influential, yet is a space and an emptiness. And while I have no cognitive memory of it my body feels different. My body has a memory of it. Obviously I have an injury but one step beyond that, I feel different having touched this other space. There’s a lot of feminist theory out there that talks about the body’s memory. I think that inner… plays into maybe athletic experience as well that essentially there’s a wisdom to live the experience. There’s a wisdom to embody the experience. Whenever I’m doing these rituals and motions at some point it becomes very, very uncomfortable. The mind just turns off. As athletes we can all relate to that moment where the mind turns off and you’re just sort of purely present. It’s just effort and emotion. I believe at that moment the body is given space to talk in its own language. I would hope that or I’m curious if the death imprint that’s on my body is given space to come out. I see my art pieces as an active excavation of my body’s memories. I believe that in some of my paintings there’s the traces of a death imprint. Anja: We actually had a sports psychologist on the show talking about trauma and how that leaves imprints. He was talking about the technique that they use called brainspotting which is kind of a way to get into that conversation between the body and the unconscious and clear the trauma so to speak. Matthew: I think something that I’ve been exploring is just honoring my body’s needs. In a physical way and then in I don’t know spiritual. I don’t know if that’s the right word but in this other way. Anja: That could very well be- now, I’m totally out of my own expertise. He’s talking about how where we look affects how we feel because there’s like that physical link. I can see how your gestures painting can somehow go into that feeling and treat the trauma that way. It seems to be the same mechanism. Matthew: Absolutely. A very Eurocentric and Western view of the relationship between the body and the mind is that the mind controls the body. That is sort of a one-way street. I think some feminist theory and mind-body practice theory says that it’s actually a two-way street. That the way we move and hold our body changes how the mind feels as well. There’s business coaching around how we stand and how we hold ourselves and power poses. I think there’s even very accessible evidence to anybody that this is true. The question is how nuanced does it get? How deep down that rabbit hole do we get? I think just engaging this way of seeing your body and mind that they both have independent experiences. They can both communicate with each other in both directions opens up a lot of possibilities. I think that’s the space that I’m exploring with my art right now. Yesterday was a big day for me. I just did an art piece around getting in the ocean again. I entered the ocean the first time since my injury. Matthew: Yes. Last night. I did a ritual with it where we had a canvas and there’s a large circle and on one side of the circle was the ocean and the other side was the canvas. I did it at the place that I died – which is actually just a couple blocks from my house. I basically walked into the ocean and baptized myself and then came out and laid on the canvas. Then stood up and walked back into the ocean and did that in repetition for about an hour. It’s about 50 F degree air, 50 F degree water. There’s a small amount of hypothermia involved and an interesting relationship. Again this kind of athletic approach of taking my body to a point of strain and endurance. It was really meaningful. Anja: Besides feeling cold obviously does going to that place bring back something? Matthew: Yes, right before I started I was kneeling and just having a moment and really this flood of emotions came out. It was one of the first times that I was able to fully process having died. It was very emotional. Then the first few laps it was a very foreign experience because my body feels different analysis the last time I was in the ocean. There was a lot of conflict but after the third or fourth time my body started to really remember how to work with the current and the swell. Then it became very enjoyable and a really positive experience. And after the whole thing was done and I was just so happy and felt great. Matthew: Yes, most of the people who have bought my art know my story, know me personally or through another friend and I think people purchase it for different reasons. I would say that these days, a lot of our relationships to possessions is we see them as disposable and interchangeable, like there’s just very cheap consumer goods available and we’re just constantly buying and disposing. To own something completely unique like a unique object and it has some meaning and also know it as a part of my story. I think people are buying a part of this journey. -Please buy my art! No, I’m just kidding. [laughter]Anja: I guess it adds another dimension if you understand where it comes from. The story is always an important dimension of any achievement, I think. Matthew: I think that’s something I’ve tried to make part of my artistic practice. Making the story and the process visible. A lot of art is completely removed from people’s personal lives. It’s seen as unprofessional to have personal sentiment in your artistic practice. It has to be very theoretical. A mentor of mine just gave me the advice to embrace my story, and so I’ve found this thread where it is extremely personal to me. But I also think that I make an effort to be very rigorous as an artist. I read a lot. I understand other artists that have done similar things. In art, you pursue these lines of inquiries of a question. In mine, it is really exploring this relationship or presence and absence through action art, which I think isn’t something that has been done that much. So I do think it’s a new addition to this line of artistic practice and that’s also what makes it very rewarding. I take it seriously, and a part of my weekly practice is research, always learning about new artists and art history and art theory. Anja: Maybe that skill development still is from your athletic background. [laughs]Matthew: Yes, so again that growth mentality. I mean there’s ways of making art that would be easy. I’m not doing that. It’s very challenging, and it’s actually only satisfying to me if it is challenging. If I know that I have pushed myself. I think one of reasons that art and athletics seem so similar to me is they’re very open-ended. How do you know that you’re an excellent athlete? There’s no objective bar. It’s a sentiment inside of you. It’s really a knowledge that you are authentic with your effort, that you have invested deeply and that’s something that really only you know, and only you can tell yourself. It’s the same as with art. It’s such an open ended endeavor that the only way that I know I’m doing well is based on how I feel internally. Every athlete knows when they’ve cheated themselves and they backed off of a workout or haven’t. You just don’t sleep but you just get angry and frustrated and know that you can do better. I have a lot of those similar emotional experiences with art practice as well. Anja: Your story is just so inspirational for anybody who wants to – or needs to – refocus themselves or are in a situation where you need to reinvent yourself, or want to reinvent yourself because you’re taking so many things from your past with you, but you’re not stuck in your past. I look at where it’s taking you. It’s amazing. I’m so happy you want to share this story with this show and our listeners. If people want to go check out your art, do you have a web-page? Matthew: Yes. It’s my name, matthewwetschler.com. Anybody that wants to reach out and chat, I’m always happy to have a conversation and love connecting with people. There’s a way to contact me on my web-page. Anja: Well, thank you so much. I really appreciate you taking the time to do this and sharing so generously everything that has happened to you and being an inspiration to all of us, I think. Matthew: Well, thank you. It was my pleasure. We will always have our values, our ability to love, to arise to challenges at whatever level we are at..
And if we can do like Matt and befriend and nurture the part of us that will always be within us – our core – then we can stand stronger to face any situation with happiness and self actualization. I would love to hear your comment on this interview – even if in a private message. If you want to get notified whenever I upload a new show, do go ahead and subscribe. I will be posting lots more athlete stories, interviews with world class sports insiders and valuable tips for athletes. That’s why I think this is such an important story to share with you as athletes.